Mild motion-sickness isn’t perhaps the first thing you expect to feel in north London’s Holborn Studios. That’s until you realize that much of the office-space is actually located on converted barges, with a gently bobbing quay providing a walkway onto the snappily-named Eagle Wharf. This is the base of production company Hammer & Tongs, founded by director Garth Jennings and his producing partner Nick Goldsmith. Here Jennings awaits the press to discuss his second feature, Son of Rambow, along with his young stars Will Poulter and Bill Milner, and co-star Jessica Hynes (nee Stevenson). All are in good humour, as you’d expect given that the film has proved a hit on the festival circuit, and its long-awaited UK release is only a few weeks away. With the budget eventually secured, taking a step back in terms of production size was a relief for Jennings, who, having come from a background in music video production through Hammer & Tongs, found the big-budget studio experience to be sometimes cumbersome on Hitchhiker’s. “We [had] got to do it exactly as we wanted to, but we suddenly inherited all this studio stuff,” he explains, “We had a load of people, it means you’re a lot slower, it’s harder to get what you want, just the numbers… So it was rather nice to do Son of Rambow and go, right, you really don’t need all that stuff.” Cutting back on the studio fat meant Jennings could also pay more attention to his stars. Hynes describes how the production’s small scale helped preserve its charm: “They’ve solved problems with the film within their own sort of creative team, which has meant that it’s kept its heart.” As Jennings banters back and forth with Milner and Coulter in the Holborn Studios barge, they offer a glimpse of how much fun the shoot must’ve been. “It was an amazing thing for a director to have people who just, I mean when you say ‘Can you be dragged a hundred feet along the floor really fast by the kite there?’ (imitates the boys) ‘Yeah, cool,’” Jennings gushes. Son of Rambow was originally scheduled for release last summer, but legal problems restricted it to the festival circuit instead. Jennings and Goldsmith had gone into production not knowing who owned the rights to First Blood (Son of Rambow uses clips of Stallone, and, of course, the correctly-spelt name), but discovered afterwards that, in Jennings’ words, “people own different parts of Rambo”, which complicated things. Jennings describes the production mentality, with a wide smile: “[We thought] we’ll just make it, and it’ll be good, and then they’ll see it and go, oh alright, and, er… that was unbelievably naïve.” Luckily, the legal issues have all now been sorted, and the film even has the seal of approval from Rambo himself, to Jennings’ obvious delight: “Sly’s seen it, and he gave me a very, very nice review, yes, he was very sweet. 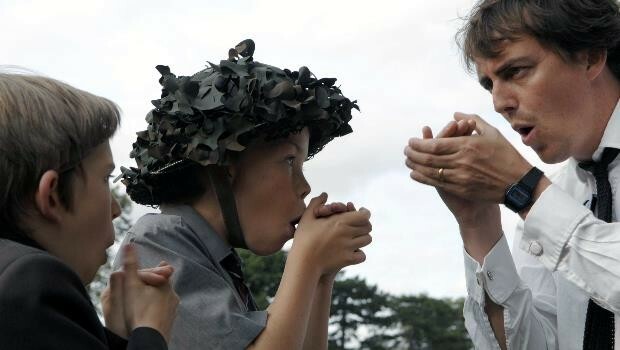 Lovely to get his blessing.” Lets hope Son of Rambow gets the box-office reception it so richly deserves.